Please see Links page for PDF download. Q. How fast do you ship the products? A. All items are shipped as soon as possible after your payment clears. Almost definitively within 24 hours of payment clearing. Q. What shipping services are offered? A. For Australian customers, postage will be via Courier or Regular Registered Post with the option to Insure. International shipping requires Postal Insurance. Q. Can I pick my item(s) up? NO PICK-UPS we are sorry. Don't fret because we strive to give the lowest combined shipping cost on items. Q. What size cups fit in the cup holder? A. 70-80mm in diameter cups. Q. Do you supply the Coffee, Milo, Sugar, Tea, Stirrers & Cups? Q. How long is the warranty on the clickers? A. The red Standard Clickers come with a 12 months warranty and should last well beyond that time. Having said that, they do break from time to time, especially where clients put water into the cup first and then place the cup under the unit, which causes steam and soluble product to react and gradually harden. In this instance, the metal shaft can break eventually. 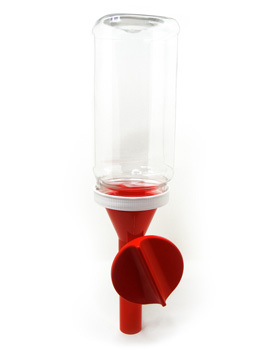 This web site and all of its contents (www.quickiedispensers.com.au) are owned by Quickie Dispensers ABN: 65 004 526 472. The use of this site are governed by the following terms and conditions, as amended from time to time (the "Terms and Conditions"). By using this Web Site for quotes, purchases or as a reference you agree to be bound by the Terms and Conditions listed. Note: This Web Site is subject to copyright under Australian laws. All Quotes are a Obligation Free Service and Valid for a period of 30 days or until stocks last, from the date of issue by the company, unless otherwise agreed by ‘Quickie Dispensers' management. Pricing details, delivery estimates, and other financial information offered is current at time of display only. Prices are subject to change without notice. By placing an official sales order for a purchase with ‘Quickie Dispensers' implies that you as the purchaser agree to all our terms and conditions of sale as listed. Please contact us direct if you have any further enquires before ordering any goods. We strictly Do Not Accept any Trading Accounts or Credit Accounts. Equipment will Not be dispatched until all monies are paid & cleared in full. Some items may not be in stock at the time of placing order. One of our sales consultants will contact the purchaser within 24 hours to confirm delivery time and stock availability. Waiting times for goods can vary from 1-2 days for stocked items and approx 2-4 weeks for special orders in some cases. - Cheques (Business & Personal). INTERNATIONAL CUSTOMERS pay by PAYPAL ONLY (unless otherwise specified by Quickie Dispensers team) via the payment request invoice sent from us via email, using your Paypal funds or credit card. If you pay via e-cheque allow for funds to clear. Equipment remains the property of Quickie Dispensers until payments have been received in full and all monies have been cleared or deposited into the nominated ‘Quickie Dispensers’ bank account, or payments processed. 'Quickie Dispensers' accepts no responsibility for item(s) once dispatched. Insurance is available if required at buyers expense. All items are buyers responsibility once sent out. Quickie Dispensers will not be held accountable for any loss or damage in transit caused by Australia Post or any other delivery service. 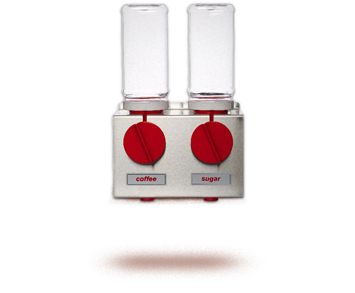 The red 'standard clickers' from 'Quickie Dispensers' are backed by a 12 month warranty. If your product is faulty within the warranty period please contact Quickie Dispensers. Please Inspect goods on delivery, If they are wrong or are damaged please write this on the delivery documents prior to signing for delivery and contact our office immediately. If an item is received and is damaged or faulty in any way, you should immediately notify ‘Quickie Dispensers’ by phone or email listing your contact name, address, phone and fax numbers our invoice number and details of the fault and what is wrong with the item. The manufacturers need to be contacted immediately in order to rectify any faults and all products include warranty cards and phone details. Any delivery dockets or consignment notes must be kept and also submitted to ‘Quickie Dispensers’ for claims against transport companies. It may be necessary to forward photographs by form of email, phone or post for any items sent in order to assess damage to goods. Prices advertised on-line Do Not include delivery fees unless otherwise stated that delivery is free. For this reason goods are supplied by delivery only. Delivery fees will be listed in your quote. Illustrations, sizes and colours in this web site are for purchasing guidelines only. Manufacturing changes can result in variations to illustrations. All measurements and capacities are approximate and can vary due to manufacturing changes. The depiction of colours is as accurate as reproduction allows. Delivery of illustrated merchandise is subject to availability and “Quickie Dispensers” cannot be held responsible for delays. Any merchandise on this web site may be discontinued without notice. This web site is for the general information in order to purchase items, and whilst all care has been taken, information in this web site is not to be taken as a substitute for specific advice. We accept no responsibility for any person who acts on the contents of this web site. 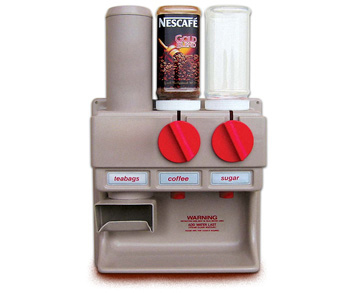 This Web Site (Quickie Dispensers) are subject to copyright under Australian laws. www.quickiedispensers is under copyright & owned by ‘Quickie Dispensers’, which reserves all rights. You can not & must not copy, communicate to the public, adapt, transfer, distribute or store any of the contents of this Website including but not limiting any text, pictures or incorporate any part of the Web Site into another web site without ‘Quickie Dispensers’ written consent. This Web Site also includes registered and unregistered trademarks. All trademarks displayed on the Web Site are trademarks of their respective owners. Your access to or use of this Web Site does not constitute or create a license or any other right to use the names, trademarks, copyrights or any other intellectual property of ‘Quickie Dispensers’ or any other party contained on this Web Site. How does Quickie Dispensers protect customer information? Credit card payment should be made over the phone or via PayPal. It is not recommended to send credit card details via email. Furthermore, all of the customer data we collect is protected against unauthorized access. Will Quickie Dispensers disclose the information it collects to outside parties? Quickie Dispensers does not sell, trade, or rent your personal information to others. Quickie Dispensers may provide aggregate statistics about our customers, sales, traffic patterns, and related site information to reputable third-party vendors, but these statistics will not include personally identifying information. Quickie Dispensers may release account information when we believe, in good faith, that such release is reasonably necessary to (i) comply with law, (ii) enforce or apply the terms of any of our user agreements or (iii) protect the rights, property or safety of Quickie Dispensers, our users, or others. Quickie Dispensers is committed to protecting your privacy. We use the information we collect on the site to make shopping at quickiedispensers.com.au as simple as possible and to enhance your overall shopping experience. We do not sell, trade, or rent your personal information to others. Quickie Dispensers also provides links to affiliated sites. The privacy policies of these linked sites are the responsibliity of the linked site and Quickie Dispensers has no control or influence over their policies. Please check the policies of each site you visit for specific information. Quickie Dispensers cannot be held liable for damage or misdoings of other sites linked or otherwise. PLEASE NOTE: Coffee, Milo, Sugar, Tea, Stirrers & Cups are not included. You will receive clear plastic jars. 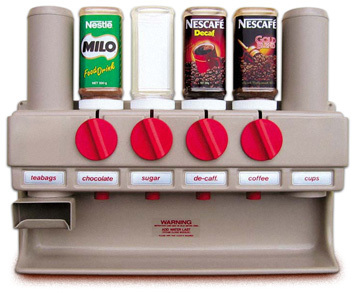 Nescafe and Milo Jars are shown for illustrative purposes only. Nescafe and Milo, logos and label artwork remain the property of Nestle.